2013 Australian Koala Silver Bullion Coins are available in four sizes with mintages for each determined by demand. 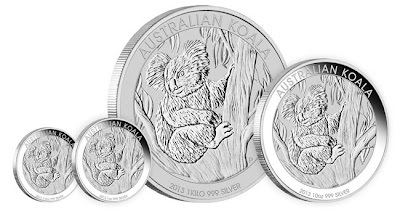 Buyers have the choice of the one kilo with a $30 face value, a ten ounce which is $10, the one ounce with a $1 denomination and the 1/2 ounce which has a 0.50 face value. Each issue is Australian legal tender with the government assuring their weight and purity.